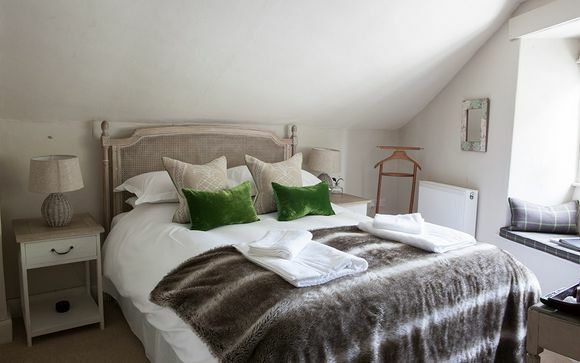 Escape to the countryside in this charming Shaftesbury Inn, where rolling green fields and romantic walks beckon you. The Fontmell offers elegant spaces and rich character that exudes Dorset charm. Dine on freshly prepared cuisine at the pub after a brisk walk through the downs - this countryside inn is certainly not to be missed. 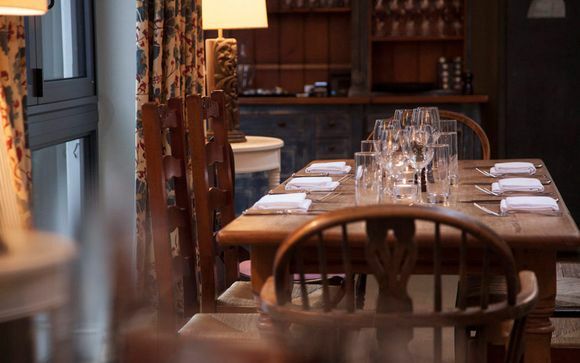 The Fontmell, a newly refurbished pub and dining room with six individually designed rooms, is serenely nestled in a valley between Cranborne Chase and the Blackmore Vale, just four miles from the town of Shaftesbury. Set in one of the most beautiful counties in England, the Fontmell exudes Dorset country charm. Dorset is host to an abundance of amazing areas to visit – from the beautiful New Forest to picturesque seaside towns. Sample fresh seafood in quaint villages or enjoy a brisk walk along through the verdant Melbury Downs. 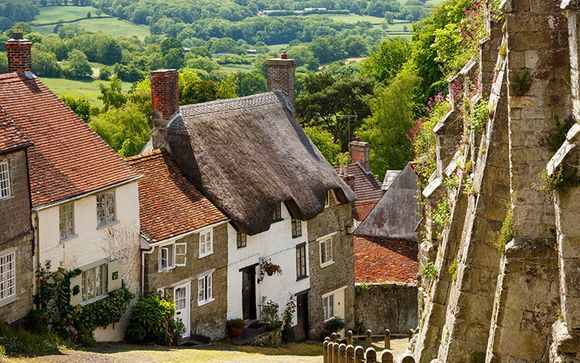 The beautiful historic market town of Shaftesbury in Dorset is perched high on a hill overlooking the Blackmore Vale – truly one of the most scenic locations for a country holiday in England. On sunny days, the panoramic views from Park Walk and Castle Hill can be spectacular. Gold Hill boasts Shaftesury's most famous view. It is no surprise that the esteemed English author Thomas Hardy was inspired by the picturesque streets and houses of Shaftesbury and so immortalised them in his work. You too will feel enlightened and inspired by the beauty and charm of Shaftesbury. Wherever you choose to spend your leisure time in Dorset, you’ll be blown away by its breathtaking natural beauty. Inland Dorset is Thomas Hardy country, with landscapes right out of his novels. You can still visit his birthplace and his later home, Max Gate, but the essence of Hardy is found in the surrounding countryside that inspired his semi-fictional Wessex. 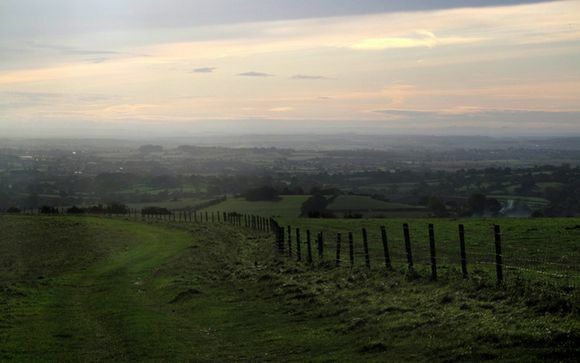 This walk takes you through the Downs in which his novels of the Blackmore Vale are set, featuring far-reaching views and an ancient landscape. The Fontmell is a quaint and intimate country inn with six individually and beautifully styled bedrooms, a fine-dining restaurant crafting fresh local ingredients into delectable and tempting creations, plus a cosy bar packed with local ales and the sounds of the village brook bubbling yonder, The Fontmell is simply bursting with Shaftesbury charm. Here, the standards are set far above an average pub conversion. The inn prides itself on quality, apparent from the renovated décor to the fabulously exquisite food, and so was awarded the TripAdvisor’s Certificate of Excellence. The pub extends over Collier's Book, Fontmell Magna's village stream, which flows between the bar and the dining room. In the peak of a warm season, the windows open up over a babbling brook to create an idyllic environment in which to eat and relax. The six individually designed delightful bedrooms at the Fontmell offer understated luxury and warmth combined with genuine Dorset hospitality. Perfect for a romantic weekend or a brief sojourn to the fresh air of the countryside, these rooms feature bright and airy decor and elegant, personal touches. All bedrooms are en suite with walk-in showers while some rooms have a separate bath. 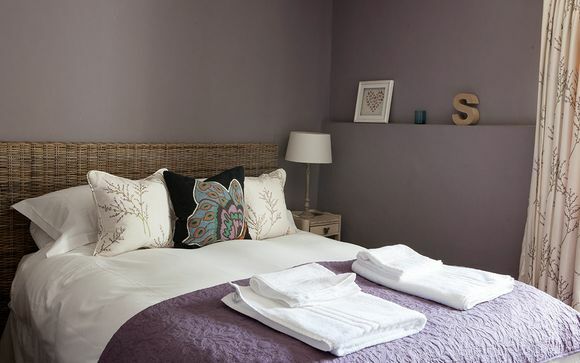 The rooms have goose down duvets and pillows atop crisp cotton sheets, ensuring your stay is one of peace and rest. Whether your fancy includes homemade sausage roll with a tall, refreshing pint at the bar, or a three course gourmet meal in an elegant candle-lit dining room, at the Fontmell you will enjoy delicious, fresh food made by Head Chef Tom Shaw and his team.Menus change daily and are always based on seasonality and the freshest local produce from the Fontmell's closely knit network of trusted local suppliers. 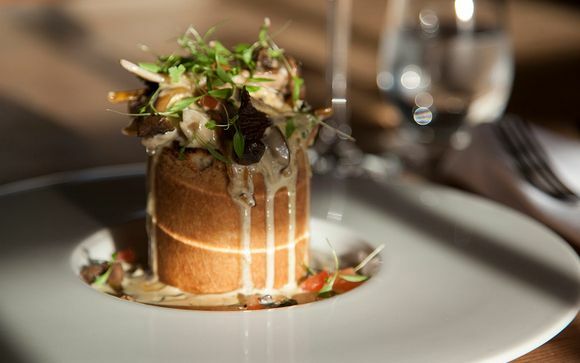 The Fontmell is fortunate to be located in a part of the country where some of the best of British foods are produced. The Fontmell receives daily deliveries of fresh fish from Brixham, meat from Somerset and Wiltshire if not from a small-holder within the village, and fresh fruit and veg are always sourced locally. The nearby Melbury Downs is an area known for being one of the most beautiful areas for a walk in Dorset. Follow the National Trust footpaths all the way to Hardy's Cottage where you can marvel at the antique and historic furnishings that accompanied the author as he penned some of his famous works. The Melbury Downs is a 3 1/3 mile walk, perfect for a brisk morning walk or a slow afternoon meander. With a day's notice, the Fontmell is pleased to offer its guests packed lunches for these walks. The colours, dramatic vistas, evocative scents and sounds of the Melbury Downs will enchant you and its peace will stay with you long after you return to everyday life.